Dashi is a traditional fish stock essential to Japanese cooking. You will find it in many Japanese soups, sauces, and stews. The two most central, essential ingredients in dashi are dried bonito flakes (aka katsuobushi) and kombu seaweed (sometimes spelled “konbu”). Usually 2 oz each of bonito flakes and kombu are used per 4 quarts of water. 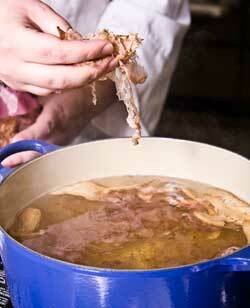 Sometimes dried mushrooms or other flavoring agents are added to the water as well. Dashi is usually only simmered for a few minutes (although longer is better), making it one of the faster from-scratch soup bases you can make. Dashi is a stock that can be easily manipulated to suit your individual tastes and the recipe you plan to use it in. The dashi recipe below was designed for a robust evening-style miso soup, and so is itself rather strong. For a milder version, use less kombu (2-4 strips), fewer bonito flakes (only one handful), and either switch from matsutake mushrooms to shiitake mushrooms, or leave the mushrooms out altogether. Wipe off the strips of kombu with a damp towel. Put the kombu and dried mushrooms in a pot of cool water, allowing them to soak for about 10 minutes. 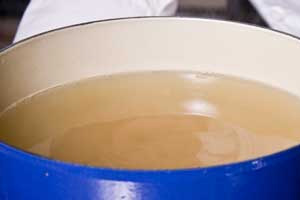 Bring the water in the pot slowly to a boil, removing the kombu with tongs or a slotted spoon when it starts to bubble. Do not throw the kombu away. Add the bonito flakes and skim the surface for any rising particles. Turn off your burner and let the dashi sit for about a minute before straining. Strain the dashi into a bowl, reserving the bonito flakes and the mushrooms. Use dashi immediately in a soup, sauce, or stew, or freeze it packaged in the amounts you plan to use later. The mushrooms can be cut down to small bites and put in miso soup, (if they’re still too tough, soak them in some more hot water until they are tender). The first batch of dashi you make with these ingredients is called ichiban dashi (ichi means one, ban is the counter for order and quality, so ichiban means “first,” or “best”). The kombu and the bonito flakes can be reused (with the addition of some more fresh bonito flakes) for a weaker dashi (niban dashi). If the kombu has soaked long enough to no longer be tough, you can slice it into smaller strips and add it to miso soup too.